The National Baseball Hall of Fame will go another year without representing the ‘Blake Street Bombers’ as no Colorado Rockies were included with the 2019 inductions. 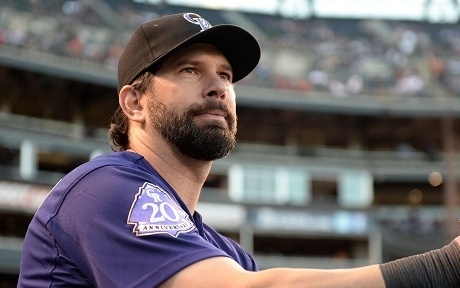 Both Todd Helton and Larry Walker will have to wait another year to potentially be bestowed with baseball’s highest honor and be forever enshrined in Cooperstown. Per the league’s announcement, this year class features pitchers Mariano Rivera, Roy Halladay and Mike Mussina, with designated hitter Edgar Martinez rounding out the quartet. Both Rivera and Halladay were both in their first years on the ballot, the former elected by the league’s first unanimous vote. Halladay, a former Arvada West High School standout, became just the second Coloradoan to be elected into the Hall with his induction coming posthumously after his 2017 death in a plane crash off the Gulf of Mexico. The class was the third four-man class in the last five years and only the fifth instance in the history of Cooperstown. With the nod for Martinez, much of the Rockies’ faithful are wondering where Larry Walker stacks up heading into his final year after garnering 54.6 percent of votes this year. Last year, the aforementioned Martinez accrued 70.4 percent of the votes, a jump from his previous mark of 58.6 percent in 2017. The two-year elevation of Martinez’ stock, though encouraging, also brings to light the hurdles that Walker faces. With only a year remaining on the ballot, the former member of the Blake Street Bombers does not have a pair of years for escalation left. Last year, Walker only accumulated the support of 34.1 percent of voters, seeing his prospects take a momentous leap this year. 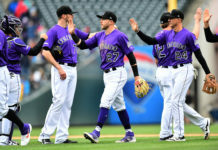 A portion of the support comes from the mindset of eliminating the Coors Field bias. In other words, Walker, though not a perfect candidate, is worthy of an election in the eyes of many, with his stats standing up against the game’s legends despite the Coors adjustment. His career slash line of .313/.400/.565 and seven Gold Gloves stand up well against his opponents. His 72.7 career wins above replacement were also the 5th-highest mark on the ballot this year and are set to stand as the 4th-highest of 2020’s possible class. Walker will be the only candidate on the ballot next year in his final year, aiding his last-ditch efforts further. Derek Jeter will likely join his former teammate Rivera with a first-ballot induction next year, a sign that only a couple spots will remain. As far as Helton goes, his waiting game has merely just begun. 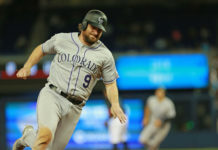 In only his first year on the ballot, the former Rockies’ cornerstone received 16.5 percent of the votes. Among the four first-year members that garnered enough support to stay on the ballot, Helton’s mark was third, falling short of both Halladay and Rivera but beating out Andy Pettitte (9.9). When viewing the rest of the ballot, Helton was given more support than many and appears to be on track for a late-eligibility induction if he maintains his pace. Among first basemen that currently reside in the Hall, Helton would rank fifth in on-base percentage (.414) and sixth in slugging (.539). Stark also pointed out that without the impact of Coors, Helton’s blend of slash line, hits and homers is only rivaled by five other first basemen in league history. The list includes Lou Gehrig and current sluggers Miguel Cabrera and Albert Pujols. The pair of former Rockies may not have made it, but their future in terms of Hall of Fame induction gained steam once again.